The innovation and technology-driven for armored vehicles market features a select few vendors that mostly take up contracts from government and commercial bodies, with the defense sector being the key determinant of the market’s overall development, finds a new research report by TMR. Most of the market’s leading and most reputed vendors are headquartered in North America and Europe, making these regions the frontrunners and leading regional segments. The demand for integration of technologically advanced electrical, photonic, and efficient and highly secure communication components in armored fleet to maintain an edge over extremist powers is gaining strength, stimulating the need for technological transformation for the market. In the next few years, continual investment in R&D activities, development of highly advanced, and innovative technologies will be the core of growth strategies adopted by key vendors, including Oshkosh Corporation, Elbit Systems Ltd., BAE Systems plc, Lockheed Martin Corporation, and Rheinmetall Defence. Rising concerns regarding security from insurgent groups and terrorist attacks in countries across Asia Pacific have highlighted the need for modernization of military groups, pressing government bodies to allot more funds to the defense sector in the past few years. Countries such as India, China, and South Korea are focusing on the procurement of enhanced armored vehicles, driving the global market. Developed nations such as UAE, Israel, Saudi Arabia, Iran, and Turkey are also substantially increasing their military budgets and increasing the numbers of technologically advanced armored vehicles in their military troops. The need for reducing the weight and size of vehicles deployed in the defense sector, and the demand for highly efficient, compact, and robust vehicles and weapons is also a key driver of the global armored vehicle market. Promising advancements on fronts such as communication medium, adaptability, navigation, surveillance, protection, and enhanced situational awareness are expected to appeal to an extended set of clients in the next few years. In most countries across Asia Pacific and the RoW sectors, lack of regulatory standards differentiating protection levels leads to high prices and an increased risk of fraudulence from manufacturers. These factors are also leading to the emergence of several unauthorized vehicle armoring companies in countries such as India, China, and Brazil, challenging businesses of established companies to a certain extent. The high costs of advanced armored vehicles is also a major deterrent for the global armored vehicles market, especially when sales across cost-conscious developing economies are considered. Fluctuating raw material costs, import expenses, and a horde of taxed levied by countries often result in increased costs of end products. Maintaining a balance between the base cost of products and their quality is thus one of the key challenges for the global armored vehicles if companies wish to expand their businesses across emerging economies. 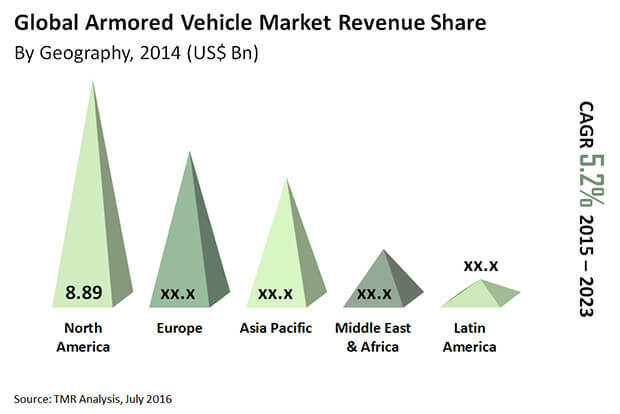 Transparency Market Research states that the global armored vehicle market is expected to expand at a CAGR of 5.2% from 2015 to 2023. At this pace, the market, which had a valuation of US$22.73 bn 2014, is expected to rise to US$35.49 bn by 2023. In terms of technology, the market is presently dominated by the mine protection segment, which accounted for over 24% of the overall market in 2014. In terms of end-use segment, the military sector held over 62% in the global market in 2014.